High school was pretty much like this huge party I wasn't actually invited to, but I still had to show up to every day. 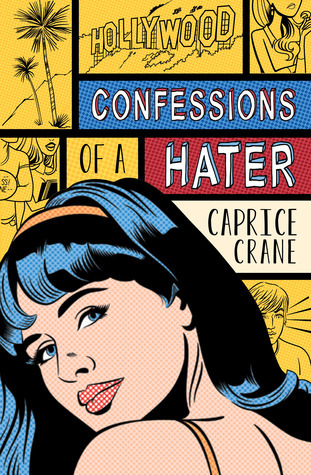 In Confessions of a Hater, Caprice Crane's funny--and deeply felt--observations about high school, bullies, popularity, friendship, and romance will leave teens thinking . . . and talking. Caprice Crane is the internationally bestselling author of five novels and a writer for both television and screen. Crane has written for the hit TV show 90210 (2.0) and spent a number of years writing for MTV. Crane won awards for both her debut novel, STUPID AND CONTAGIOUS, and her second novel, FORGET ABOUT IT. Her 3rd novel and 4th novels, FAMILY AFFAIR and WITH A LITTLE LUCK, received rave reviews and Crane's fifth novel, her DEBUT Young Adult novel, CONFESSIONS OF A HATER, hit stores on August 27th, 2013 and has been garnering lots of attention including fantastic reviews in the New York Times and the Chicago Tribune. Crane divides her time between New York and Los Angeles, depending on the mood of her dog, Max. Seriously, I was laughing out loud at times. Of course, there was some serious moments too, and even a couple of sad ones. All-in-all, it made for one great story! We can all relate to high school and wanting to fit in somewhere. This story is a cute look at that part of life and all of its' clichés, but with a twist. The author, Caprice Crane, is so talented. The story flows with fast with the ease of her writing. She teaches a valuable bully lesson in the story too. It had a ton of impact on me. I just know it would have the same effect on other readers. It's so powerful. As you can plainly tell, I LOVED this book. I know most of you, if not all, will too. Get it today! I usually don't read YA, but I might get this one. I'm always interested in a funny book. Thanks. I will have to check this out--what a fun bright cover too! This one sounds like so much fun! I am glad you enjoyed it so much!